Interview at Babblings of a Bookworm Reveals All! Well, maybe not “all”…But Ceri interviewed me at Babblings of a Bookworm and asked questions that I’d never thought about — so I said some things that even surprised me! 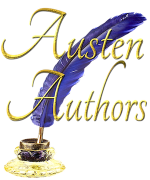 Also, an excerpt from chapter 3 of Mr. Darcy to the Rescue and a giveaway.